Only 0 days to go! To create your fundraising page quickly, simply enter your details below. Once you confirm details on the next page, we will create you iDonate.ie account and fundraising page. You will receive emails with more details. 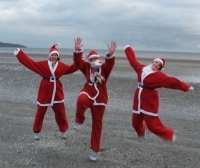 Description : This December why not join us for a 5k or 10k run (dressed as Santa) to raise money for young leaders in the heart of Dublin city. We will be venturing to Bull Island beach on the morning of December 4th and we would love for you to join us! If you can't make it but would still love to support Dublin teenagers then donate to our eager team of Santa Dashers now!